I promise, my play closes this Sunday, so next week, I should have more time for blogging! Meanwhile, here are a few Instagram pics from the past week or two. Beginning with our old, beloved wooden Clifford pull-toy, and some Clifford the Big Red Dog paperbacks. Today is the 85th birthday of Norman Bridwell, Clifford's creator! Happy Birthday, Mr. Bridwell! Some friends of mine who lived in New England for a spell met Mr. Bridwell. They said he is a very nice man. That's always good to hear. 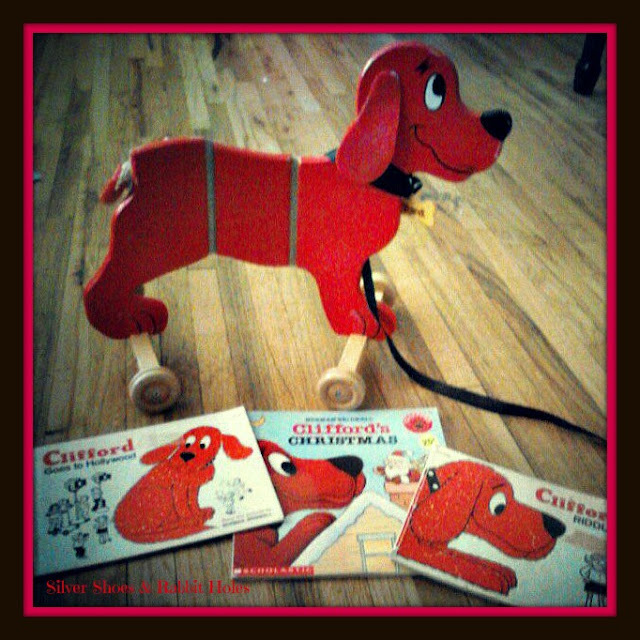 The two books on the ends, Clifford Goes to Hollywood and Clifford's Riddles, are from the 1970s. The paper is newsprint quality, the pictures are black and white. My grandmother got them at a garage sale, and she would read them to me when I would go to her house to spend the night. Clifford the Big Red Dog was "our thing." She had more of the books, too, but I don't know what became of them. Top: Wichita State University. We went to the art museum there to deliver cookies to a friend. As we were leaving I pointed out Wilner Auditorium, the theatre building where Mr. B and I first met. They were far more impressed by the rain. 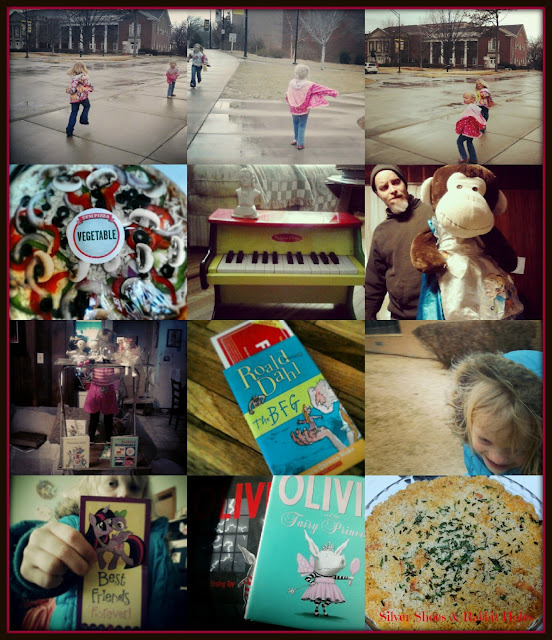 Second Row: A pretty pizza from The Fresh Market, our toy piano with a bust of Bach - someone was having a Schroeder moment - and Mr. B with monkey, wearing the girls' Alice costume. Third Row: Little Sis's ambitious "book stand," a happy Scholastic order (The BFG!!! ), and Little Sis running circles around me outside of Big Sis's school. The play has been going well. Great audiences. We've had two performances, and we have three more to go. I'm auditioning for The Cherry Orchard tomorrow. Crossing fingers! In more performance news, Big Sis has a speaking role in her first grade show at school! She attends a performing arts magnet school, and pre-K, 1st, 3rd, and 5th grades have full productions. She's been bringing her script home to study each night. And last week, costume photos were posted on the bulletin board at the girls' dance school - they know what they will be wearing in their recital this spring. We're not exactly a showbiz family, but it's fun to have something artsy in common! Merry Weekend, One and All! Happy Reading! I'm looking forward to it! I do so love Oz!!! Oh ,my gosh you are making my heart beat faster with all this theater talk!!!!! Good luck with the audition!! YES PLEASE re favorite macaroni recipes!!!!! So great that there's so much theatre stuff going on in the family! I love the BFG soooo much, hope you'll enjoy it!